If you are interested in using pavers for your driveway, and you want to install the most durable material, your first consideration should be cobblestone pavers. A cobblestone paver driveway can stand up as well as any other driveway material. What's more, they create a unique and "old world" look for your driveway, which can really add charm and value to a nice home. Cobblestone pavers are usually composed of pieces of granite, although basalt and other rocks are sometimes referred to as cobblestones when installed. Granite is a hard rock. It has been used as driveway material for centuries, and many of those driveways have remained in service just as long. Cobblestone pavers, which are also referred to as Belgian block pavers, are not cheap. If you are looking for a low budget driveway, you might be better off considering concrete pavers, gravel, concrete or asphalt. If you want a tough, attractive and unique driveway, it's hard to beat cobblestone. Granite is stain resistant, it isn't affected by weather and it doesn't crack or split like most other paver materials. If you like to look of cobblestone pavers but can't afford a driveway full of them, consider installing a cobblestone apron or border, or a decorative cobblestone inlay in the middle of the driveway. You might also want to consider concrete pavers made to simulate the look of cobblestone. 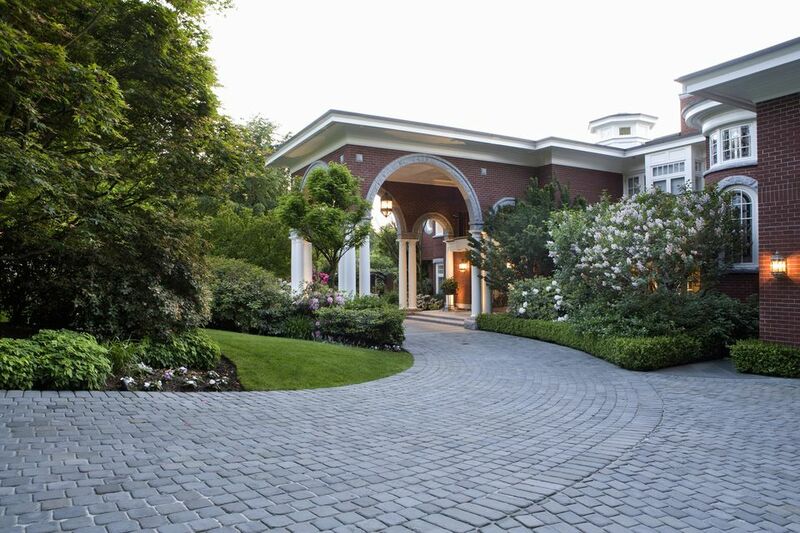 Cobblestone paver driveways require very little maintenance. Just give them a good washing once or twice a year and pull any weeds that grow through. A well-built cobblestone paver driveway can remain stable and functional for as long as 100 years. Cobblestone pavers are available in several sizes, but the cost usually runs about $15 per square foot. Installation costs could add another $10 per square foot for a DIY job or $30 for a professional installation. Installing a cobblestone paver driveway is labor intensive, but it doesn't necessarily require special skills or heavy machinery. If you aren't in a hurry and don't mind the challenge, the job is very much a DIY option. As tough as granite cobblestone pavers are, though, the strength of a driveway built with them is only as good as the installation. Cobblestones can be set in mortar or laid dry. The job begins by removing the old driveway or grass and excavating about 7 inches deep, depending on the thickness of your pavers. Add about 4 to 6 inches of gravel and compact well. Add a layer of sand, smoothed and compacted. Run a string line around the borders of the driveway to help guide the installation. Start laying cobblestone pavers in the garage, then work your way down the sides of the driveway. With the edges in place, begin filling in the field. Maintain a consistent joint size. If you need to cut cobblestone pavers, use a hammer and chisel or a saw with a diamond blade. When the cobblestones have all been laid, compact the surface to set the pavers about 3/8 in. in the sand base. Blow out the joints with a leaf blower, and then begin filling the joints with either grout or sand. If you are using grout, be sure to follow the instructions on the package. You can only mix small quantities of grout at a time. Use a squeegee to spread the grout, working it carefully into each joint. Let the surface dry thoroughly before driving on it. If you are using sand, use a brush to move sand into the joints.